Danny Gregory and Koosje Koene, founders of Sketchbook Skool, have asked me to join their Fakulty to teach an art klass on Storytelling (Oh…Yes, this is the proper spelling of “class” at Sketchbook Skool) among other outstanding artists I’m so proud to join. 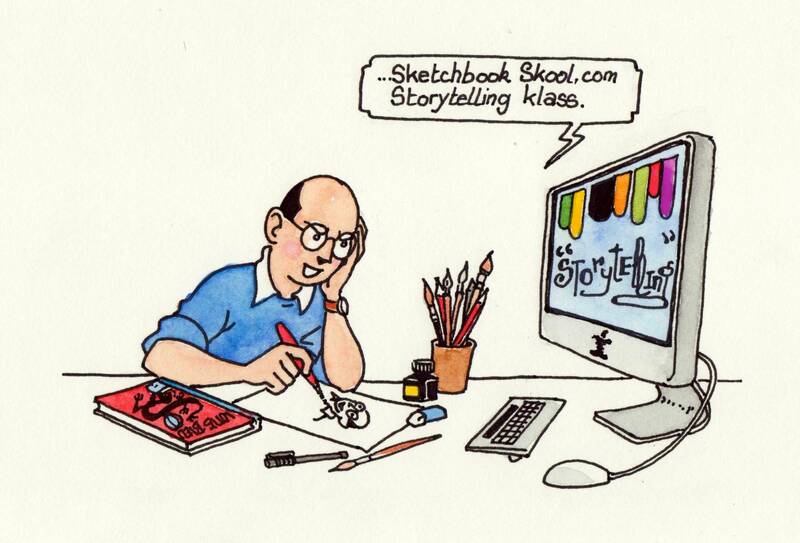 If you’ve never heard of Sketchbook Skool, I urge you to have a look at it on their blog. It’s an amazing online video-based art school and global community dedicated to teaching and inspiring people to tell their stories through illustrated journaling. It’s a fast growing community with more than 5 000 registered students and a fabulous experience every people who like drawing, beginners as experienced artists, should take once in his life. Among many other things, I gave an online demo in my klass (thru an amazing video shooting) on how to create a cover for a great book. And of course, I decided to draw a Flinflin Album cover. 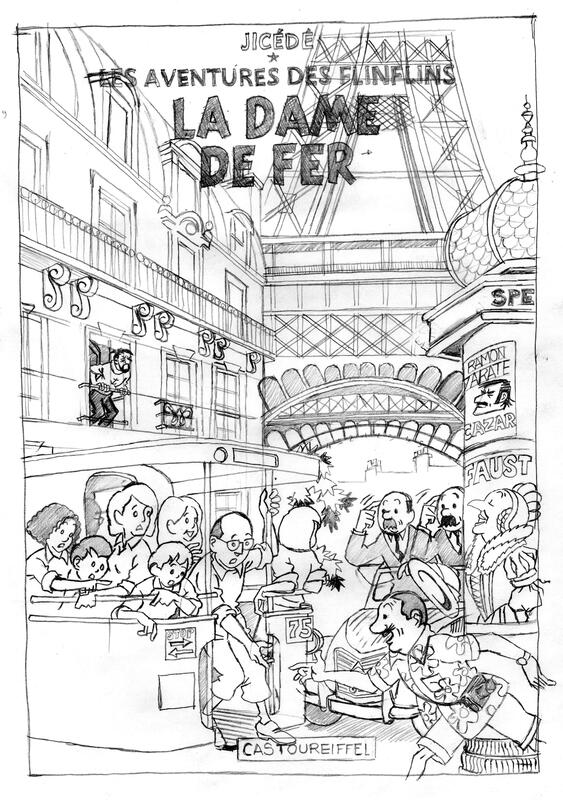 Surprisingly, though we spend most of our time living in Paris, I never did a Flinflin cover on Paris, until now. Probably because our Parisian life is our daily routine, I suppose. So I decided this course was a great opportunity to craft a special tribute to this enchanted city we never stopped loving. 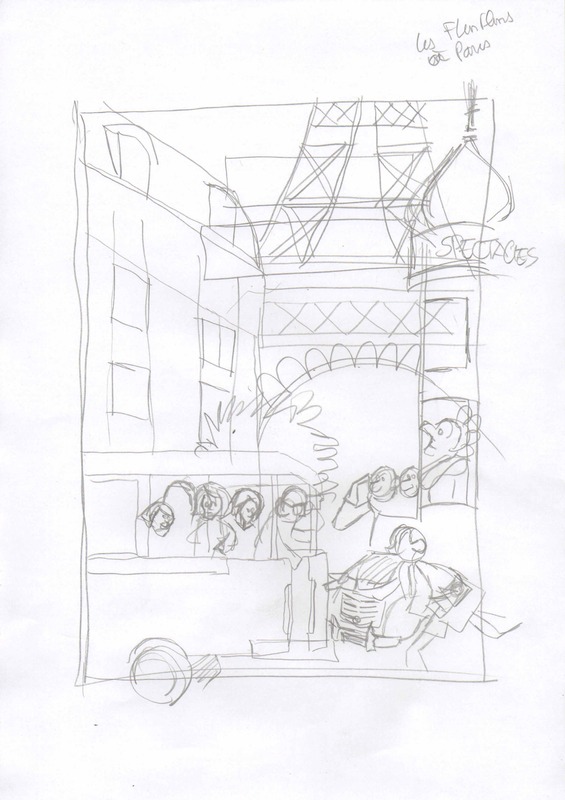 I did first a quick sketch, trying to elaborate an image that could best figure Paris in everybody’s mind. Of course, the most representative element of the City of Light is undoubtedly the Eiffel Tower. While it is mostly shown far on the horizon in one full piece, I thought, on the contrary, it would be better to take a closer view to make people realize how gigantic it is. 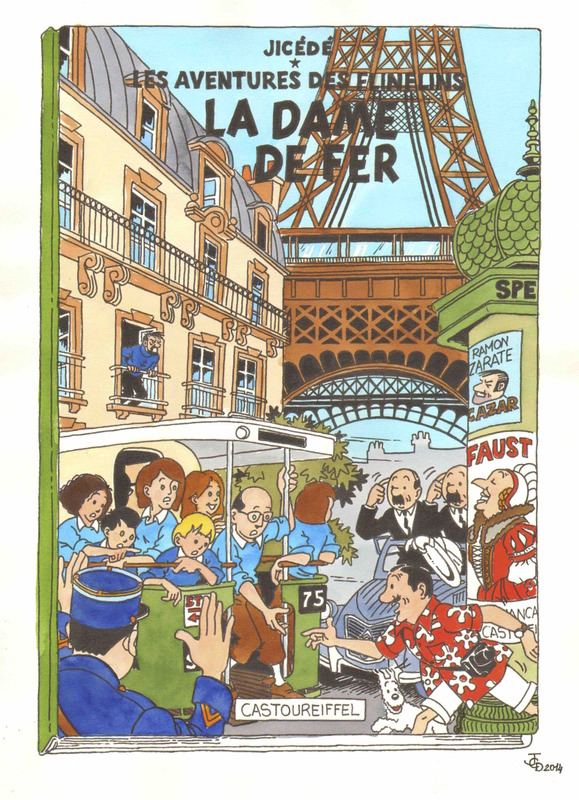 3 other obvious significant elements should be found: Haussmann buildings with their highly recognizable zinc roofs, a ‘Colonne Morris’, so typical of this city, displaying a poster on the next opera sung by Bianca Castafiore and… Paris traffic jam. Since we are a large family I decided to show all the Flinflins characters on the rear platform of a bus, rather than in a car, to be sure everyone can be seen. Unfortunately, those platform buses are no longer in service. However, sometimes you can see some of them popping up here and there for a private party, or chartered for tourists. Oh yes, tourists…! All along the year, lots of tourists are coming to Paris, which makes it the 1st touristic city in the world. They are all nice tourists with the exception of …French tourists, often unsatisfied and grumpy. So what if we showed one of these evil pupils? We all know these evil pupils who are noisy, speak loudly, are always late and make terrible jokes. This is how Jolyon Wagg (Seraphin Lampion), the absolute archetype of the annoying guy came as a central piece of this drawing. Let’s assume he was buying one of those horrible Eiffel Towers in a snowy ball, didn’t notice his group has boarded on the bus, and has just left without him. So he’s running after the bus trying to catch him, crossing the road without paying attention to the incoming traffic, causing the Thompson and Thompson to stop abruptly their old Citroën 2CV. They popped out of their car, expressing what’s in their mind in a typical Parisian gesture. Why search for the Yeti on the Mont-Blanc when he is obviously sitting in front of you ? In one’s life, there are sometimes moments of grace that help you make the right decisions. At that time, Flinflin was working in a company in a total chaos right in the middle of a merger with its main competitor. The atmosphere was oppressive, each management team trying to pull the rug out from the opposite team’s feet. Each day at the office was an additional torment that undermined even more employee morale. Feeling how beneficial a deep break would be, one of my brothers took me for a hike in the Mont-Blanc massif. It was springtime. The weather was resplendent. Snowmelt was beginning and wildlife was just coming out of its hibernation. We inspected almost every footprints left on snowfields, in the hope – who knows – we may discover tracks of the Yeti. Alas, chamois, marmots and foxes footprints, but no single evidence the Yeti was around. Never mind, these three days of hiking were sublime to wash our minds: for 72 hours we had met real life: physical efforts, meeting warm people, and a majestic Nature. Back at the office, my boss has just been fired and the guy replacing him told me I had an hour to go the same way. I didn’t care that much: This trek helped me realizing I was wasting my life in this company. I took my paycheck, got home, pulled out a sheet of paper and designed this cover in 2 days. As Tintin, who parted overseas seeking for the Treasury of Red Rackham while it was almost under his nose, I went in the Mont-Blanc hunting for the Yeti I have been hunging around for several months ! Pourquoi aller chercher le yeti au Mont-Blanc alors qu’il est assis en face de vous ? Dans la vie, Il y a des parfois des instants de grâce qui vous aident à prendre les bonnes décisions. A cette époque, Flinflin travaillait dans une entreprise en pleine crise qui fusionnait avec son principal concurrent. Le climat y était éprouvant, chaque équipe de direction s’attachant à savonner la planche de celle d’en face. Chaque journée au bureau était une épreuve supplémentaire qui minait un peu plus le moral de tous les employés. Sentant combien une grande bouffée d’air serait salutaire, l’un de mes frères me proposa une randonnée en Vanoise. C’était au printemps. Le temps était resplendissant. 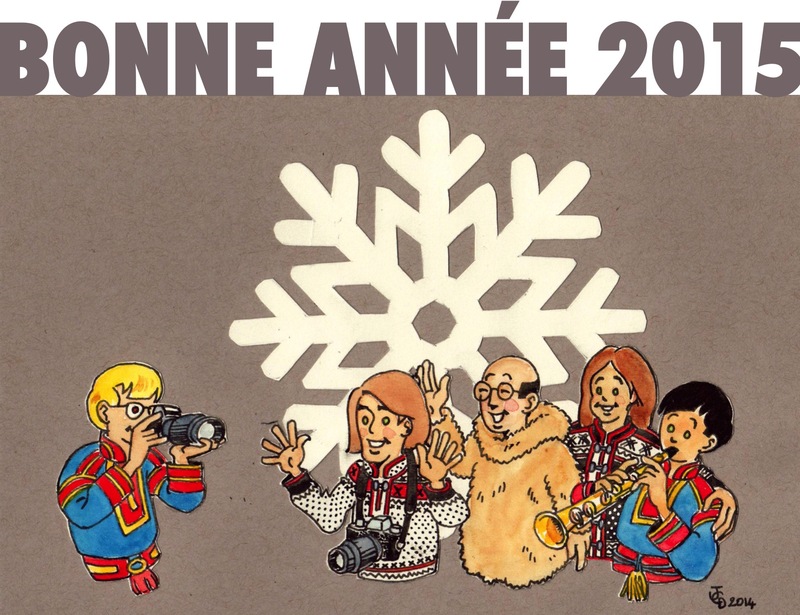 La fonte des neiges avait commencé. La faune sortait tout juste de son hivernage. Nous inspections les traces laissées sur les névés, dans l’espoir – qui sait – d’y découvrir les traces du Yeti. Hélas, des chamois, des marmottes, quelques renards mais point de Yéti en vue. Peu importe, ces 3 jours de randonnée furent sublimes pour se laver l’esprit : pendant 72 heures, nous avions côtoyé la vraie vie : une vie d’efforts physiques, de rencontres fortes, face à une Nature en majesté. Au retour, mon patron s’était fait virer et son remplaçant m’annonçait que j’avais une heure pour prendre le même chemin. A dire vrai j’étais plutôt soulagé : ce trek m’avait fait prendre conscience que je gâchais ma vie dans cette société. J’ai pris mon chèque, je suis rentré, j’ai sorti une feuille de papier et j’ai dessiné cette couverture en 2 jours. 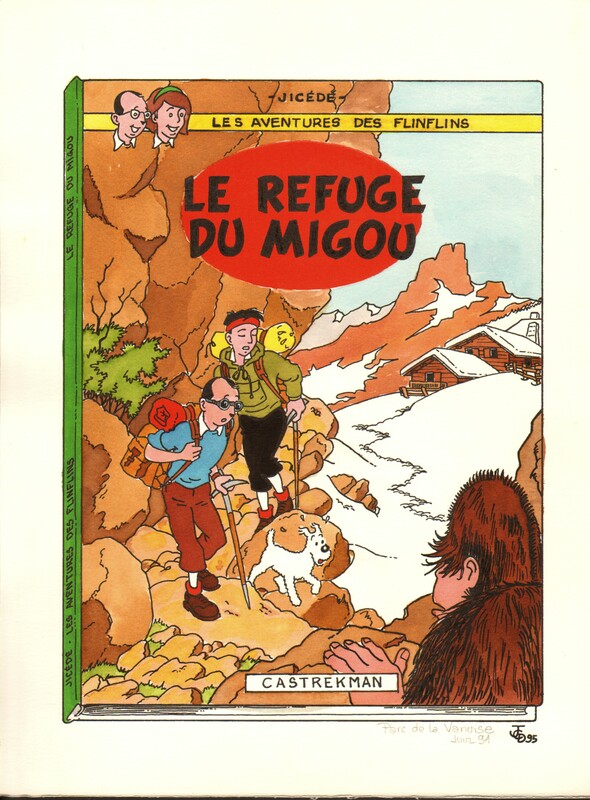 Comme Tintin, parti aux antipodes à la recherche du Trésor de Rackham Le Rouge qui était, en fait, sous son nez, j’étais allé chercher dans le massif du Mont-Blanc, le Yéti que je côtoyais depuis plusieurs mois ! I am lucky guy because I grew up in a land of freedom, a country where men decided to free themselves in 1789 with the French Revolution and chose to write the Human Rights declaration. And at that time, women who wanted to apply for a job, still needed to get a written authorization from their husband. There were very few TV programs for kids, except on Thursday, the day off at school. 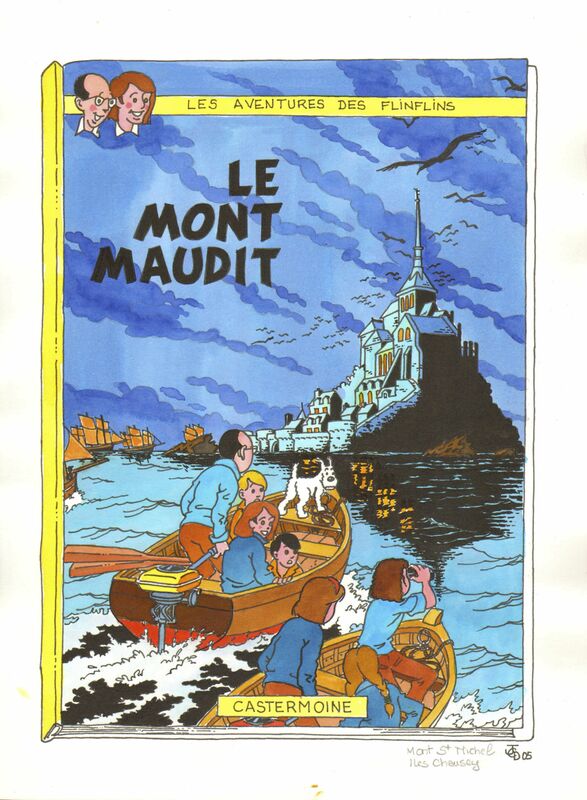 Comics were our primary home entertainment, with 3 main magazines ‘Le Journal de Tintin’, ‘Spirou’ and’ Pilote’ with its emblematic character, Asterix le Gaulois, who featured exactly French spirit: a nation divided in as many opinions than citizens, but able to talk with a single voice when it needs to. In Pilote weekly magazine, there was another character we all loved. Le Grand Duduche created by Cabu was a lazy irreverent high school student… like us. He used to wear jeans and basketball shoes. Like us ! He also had long hairs. Like us ! He was an antimilitarist, like us and any youngster in the 70’s. And he hated overall human stupidity combined with vulgarity from people full of certainty that always hit you with their truth. In the 70’s, underground magazines were also banned (well I suppose they wouldn’t be called underground otherwise). So, we used to go directly at one of the author’s home, to secretly buy ‘sous la couverture’ L’Echo des Savanes, the first comic magazine for adults, who exuded its toilet humor. Not that we loved toilet humor, but since these magazines were forbidden, this type of humor had the taste of freedom for us. 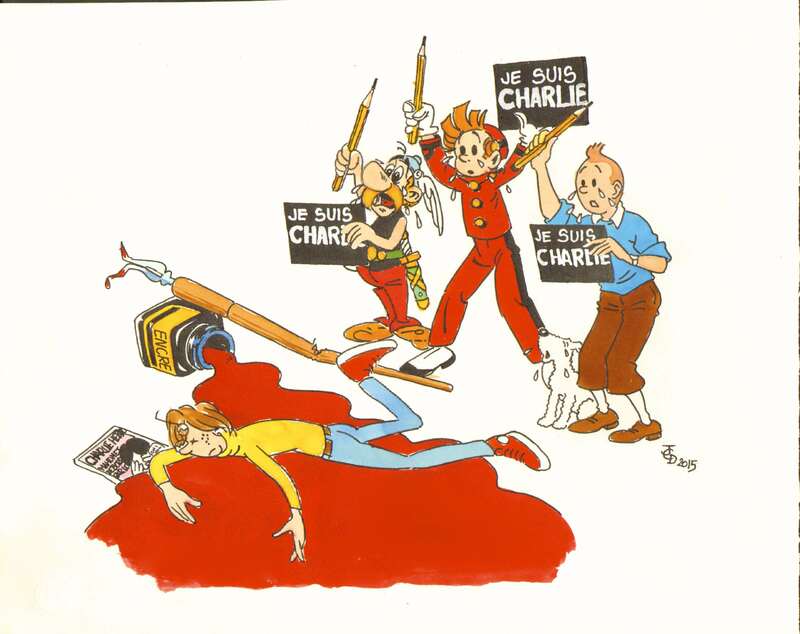 At that time Hara Kiri, the predecessor to Charlie Hebdo, a satirical magazine, which prided himself to be ‘bête et méchant’ (stupid and bad), was shut down for its irreverent cover (‘Bal tragique à Colombey’) when General de Gaulle died. But the whole staff of the satirical newspaper decided it should be born again, under the name “Charlie Hebdo”, in a ironic reference to the General. This weekly newspaper used to blast every form of order, among which 3 main pillars as favorite targets: Justice, Religion and Republican order (Soldiers, cops, etc..). Cabu specially loved to ridicule the army with his main character ‘Adjutant Kronenbourg’ in reference to the (awful) beer that was served in the bars of every military camp. So, I used to smuggle Charlie in the barracks of the regiment I have been sent to, on military service, to give myself a touch of rebel. Later on, Le Grand Duduche progressively became more a pacifist than an antimilitarist guy and turned out to be a poetic ecologist. Above all it became obvious he was a never grown-up teenager, which was one more reason for me to love him. Little by little, after years of battle the very last remaining of censorship were banned…and Charlie Hebdo came back to a more confidential circulation, though it never gave up its satirical spirit, pointing out and blasting every dysfunction of our modern world, like a king’s fool. All these memories were brought to the surface with the terrible terrorist attack. Like millions of citizen of this country, French people I was knocked to see one could be shot for having tried to make laugh people with a pencil and a paper. I was unable to draw for a few days, loosing all sense of humor. I realized behind the lost of friends and companions that filled my life with instants of joy, the freedom our generation and generations before have fought for was at stake: freedom of thoughts, freedom of expression, women rights…modern civilization! Then I put my pen on my desk and decided to move along. So, I did not listen to those who told me not to mobilize for this weekly rag. I did not listen to those who did not want to march with the National Front, or those who refused to do so with the “Red Leftists”. I did not listen to right-thinking intellectuals, for whom the very idea of this gathering would be against Charlie’s spirit. I refused to hear cowards advising me to avoid a dangerous place which would be a perfect target for terrorists. No, I went walking simply because I was Charlie. Not that I am a very avid reader: I bought it less often than I should have and they often irritated me more than they made me laugh. No, I went walking to tell my commitment Republic key values, more specifically freedom of expression, the foundation of our democracy. I went walking to share the sorrow of families of the victims, to express my rejection of violence and claim the terrorists I was not afraid… we all were not afraid ! I went walking to testify with 4 million people that the poison of hatred and division would not grow in France. I went walking silently with fervor with a worthy crowd to claim to the world that nothing could ever destabilize this country because what unites it is stronger than what may divide it. I hugged an old “harki” (muslim vet in the french army) with wet eyes, thanking him for being there. I helped my neighbor to hold up a sign ‘Je suis Hyper Casher’ (‘I am Hyper Kosher’). I met one or two famous people who came anonymously and some coquettish girls, with a pencil proudly planted in the bun. I saw, for the first time, what Freemasons in uniform looked like. I applauded police squads with the crowd. I met friends of the victims in tears and I even found a Charlie (Waldo in french) with his red hat and his striped sweater. Today Je suis Charlie and I hope I have written a new page of France history with millions of people of good will. The good thing with the rise of a new year is that you can stop for a while reviewing the past year and even take resolutions for the future. Looking in the rearview mirror, I must admit I haven’t posted much on this blog, although the year has been intense on the drawing field with the start of my ‘Storytelling’ class on Sketchbook Skool, the new online drawing university which gathererd several thousand students and a great travel sketchbook on our trip in Norway, I am still working on. So I kinda neglected this Flinflins blog. But the good news is I firmly intend to make up for lost time in 2015 and finalize the stock of unfinished Flinflins covers that are sleeping in my portfolio. Future will tell if I stick to my 2015 resolution. Le changement d’année a cette vertu que l’on peut s’arrêter un instant pour faire un bilan de l’année passée et même arrêter des résolutions pour celle à venir. Je dois reconnaitre, en regardant dans le rétroviseur, que je n’ai pas beaucoup publié sur ce blog, bien que l’année ait été intense sur le plan du dessin avec le démarrage de mon cours ‘Storytelling’ sur Sketchbook Skool , la nouvelle université du dessin en ligne qui a accueilli plusieurs milliers d’étudiants et un carnet de voyages en Norvège qui continue de se remplir. Du coup, j’ai un peu délaissé les Flinflins. Mais, la bonne nouvelle c’est que je compte me rattraper en mettant les bouchées doubles en 2015 pour finaliser les stock de couvertures inachevées des Flinflins qui dort dans mes cartons. L’avenir dira si j’ai bien respecté ma résolution de 2015. Sketchbook Skool: Storytelling with the Flinflins coming soon ! You already draw but you’re missing a stimulating environment? Or, may be you stopped drawing as a very young child, when you began to fear others’ judgment? There is a brand good news: you can now draw alone at home, at your own pace in a vibrant online community, whether you are a beginner or an experienced sketcher thanks to SketchBook Skool, the online University’s drawing founded by Danny Gregory and Koosje Koene. I will be hosting a class on “Storytelling” with other great artists. And the Flinflins will join the party of course ! It starts on October 4. Don’t miss it: interactivity is incredible and emulation amazing! See you then, maybe ? Vous dessinez et vous rêvez d’un environnement stimulant? Ou au contraire, vous avez arrêté de dessiner tout jeune enfant, lorsque vous avez commencé à craindre le regard des autres ? Il y a désormais une bonne nouvelle: on peut dessiner seul dans son coin tout en faisant partie d’une communauté dynamique, à son propre rythme, que l’on soit débutant ou expérimenté avec SketchBook Skool, l’Université en ligne du dessin fondée par Danny Gregory et Koosje Koene. J’y animerai une classe sur le “Storytelling” avec quelques autres artistes qui eux, sont talentueux. Et les Flinflins seront de la fête, bien sûr ! Ca démarre le 4 octobre et l’interactivité et l’émulation sont incroyables ! Is Ranko the Gorilla, Mont St Michel’s gate keeper ? The Flinflins love islands. All islands. May be because they are fascinated by their famous cousin’ s incredible adventures in so many of them: the Black island in Scotland, a small volcanic Indonesian Island in Flight 714 for Sydney, the lovely and exotic treasure Island in Red Rackham’s Treasure or even the ephemeral island in the artic ocean with the floating asteroid of the Shooting Star. But when it comes to Island, Mont St Michel is king. Except Mont St Michel is no longer an island. ☹ You need to drive first on a long concrete dam and park your car in an awful parking lot filled with tourists’ buses. The beauty of drawing is that you can make your own storytelling and decide to flood those horrible infrastructures under the high tide. So, on a holiday trip in the Channel Islands, the Flinflins decided to take a detour to the Mount by a gorgeous twilight autumn evening. The shops were closed and tourists were gone. The Mount was almost deserted. We took a walk alone on the ramparts. Suddenly, by the old Northern tower, dreadful footsteps echoed on the pavement with terrifying sounds of steel chain. We feared for a while to meet face to face with Ranko, the giant gorilla of the Black Island. Since then, development works have been made to give back its insular character to the Mount. We definitely need to go back there. May be we’ll be lucky enough to see the high tide circling the Mount St Michel, and who knows, we may even meet this time, with Ranko the Gorilla ! Ranko le Gorille est-il le gardien du Mont Saint Michel ? Les Flinflins aiment les îles. Toutes les îles. Peut-être parce qu’ils restent fascinés par les incroyables aventuresde leur célèbre cousin dont beaucoup se sont déroulés dans des îles: l’île Noire en Ecosse, la petite île volcanique indonésienne de Vol 714 pour Sydney, la belle et exotique île au trésor du Trésor de Rackham le Rouge ou bien encore la petie île éphémère dans l’océan arctique avec l’astéroïde flottant de l’Etoile Mystérieuse. Mais quand il s’agit d’île, le Mont St Michel reste roi. Sauf que ce Mont n’est hélas plus une île. ☹ Vous devez d’abord rouler sur une longue digue de béton pour garer votre voiture dans un horrible parking rempli de bus de touristes. L’avantage du dessin, c’est que l’on peut s’y raconter sa propre histoire, comme décider par exemple d’inonder ces ignobles infrastructures sous la marée haute. Ainsi, lors d’un retour de vacances dans les îles anglo-normandes, les Flinflins ont décidé de faire un détour par le Mont sous un superbe crépuscule d’automne. Les magasins étaient fermés et les touristes partis. Le Mont était pratiquement désert. Nous avons fait un tour, seuls sur les remparts lorsque tout à coup, des pas ont résonné sur le pavé au pied de la tour Nord avec des bruits terrifiants de chaîne d’acier. Nous avons craint un instant de nous retrouver face à face avec le gorille géant de l’île Noire. Dieu Merci ce n’était que le Père Abbé qui fermait la porte de l’abbaye. Depuis lors, les travaux d’aménagement ont été faits pour redonner au Mont son caractère insulaire. Nous devrions y retourner. Peut être aurons nous la chance d’y voir la marée haute, et qui sait, peut-être rencontrerons nous cette fois Ranko le gorille. What If Tintin were part of the Great Landing in Normandy ?